Journal of Applied Studies in Language [p-ISSN 2598-4101], [e-ISSN 2615-4706], [DOI 10.31940/jasl] is a peer review journal published by Politeknik Negeri Bali, Indonesia. It is published twice a year in June and December, since December 2017. 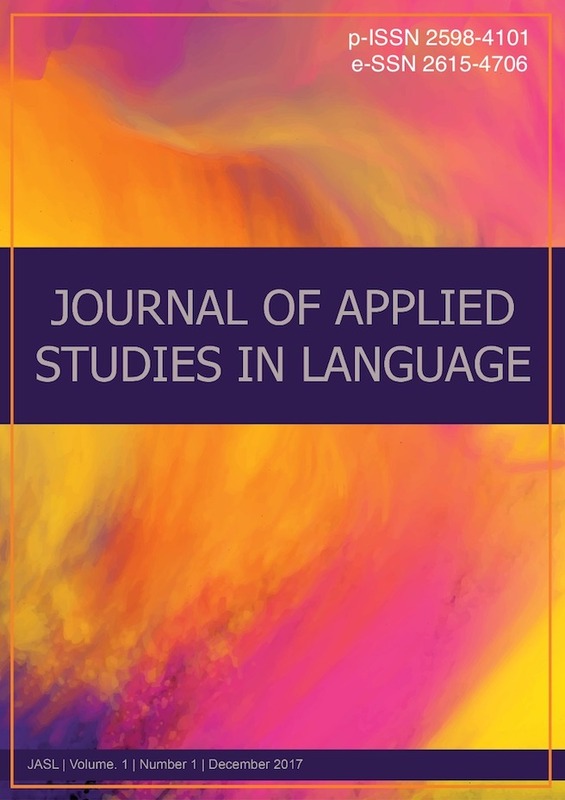 Journal of Applied Studies in Language is focusing on research in languages (linguistics) and language teaching. The journal covers two main areas: Linguistics and Language Teaching. Linguistics, including, but not limited to, Phonology, Morphology, Syntax, Semantics, Literature, Pragmatics, Discourse Analysis, Language Acquisition, Sociolinguistics and Psycholinguistics and Language Teaching, such as First Language and Second Language Teaching, and Computer Assisted Language Learning (CALL). Journal of Applied Studies in Language is indexed by DOAJ, GOOGLE SCHOLAR, IPI / GARUDA, EBSCO.